Last year in 2006, we did a funny Christmas Story which has a continuation in 2007. The latest is now in video format so turn on your speakers and enjoy the video clip below! All photos of the family are authentic but viewers are warned as in the previous year that the events of the story are part true and part untrue created for purposes of humour. By Christmas Eve, all the decorations for the season were all up already. Mom was busy making more cookies that will be given away with Han helping. ... who get creative when Mom is the photographer! On Christmas day, we got to talk to Fei and Su on the phone as they were unable to return home this year. The children had a lot of fun playing games and toys from Santa. 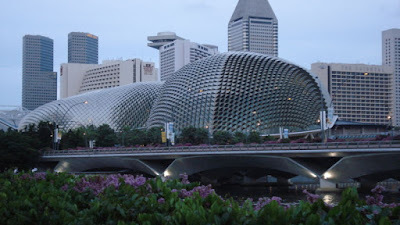 A highlight this Christmas was to see Woon Han and Woon Shuan, the two older boys, perform with their school band at the world class Concert Hall at Singapore's Esplanade, casually referred to as 'The Durian' pictured above. This was just the day after Christmas or Boxing Day. They played our family's favorite music taken from the Broadway Show 'Les Miserables', a stage musical based on the novel of the same name by the French author Victor Hugo. Click here to listen to a live recording of their opening number. Other music included the Star Trek theme and a medley of Christmas songs. 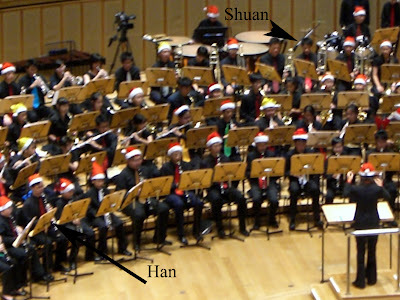 Above is the enlarged photo of the previous distant view of the orchestral platform, with arrow pointing to Han playing the clarinet and Shuan at the back holding his Trombone. A special honour for Han was that he was chosen to be one of the six masters of ceremony for the evening. He is pictured above on the far left. That's the proud mother look after the performance with Ray the youngest hugging closely. Of course, the children's highlight for Christmas must be the presents and this year they have received suprise presents left on the door outside from anonymous Santas. Pictured above are the presents the family got from Sister Su Chong serving in Oakland California! 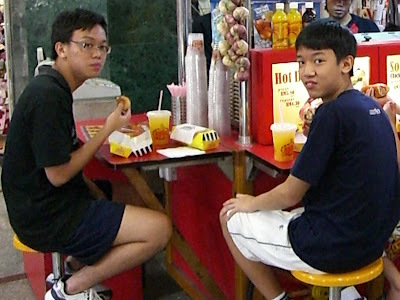 At the end of 2006, the boys started to apply for schools in Singapore. The first batch was the youngest pair. They had to sit for entrance exams to qualify to be accepted. The two older boys Han and Shuan had a tougher time in the secondary or middle school. They had to take one entrance exam after another in several schools as the competition was very high! They finaly got into a very good school at Anglo Chinese School (ACS) at Barker Rd. Well I think the schools that accepted the boys have no regret for they are multi-talented with music, sports and a good intellect too. Han the oldest boy performed outstandingly to become the top student in his entire form or level! For his success, he also received an envelope with a cheque of SG1,600 to his name! ... and Woon Ern got a prize for being the first boy in his class! He eventually progressed to St Joseph Institution (SJI video ) for his secondary level, a La Sallian school similar to Dad's Alma Mater in Kuala Lumpur. Yes, they are truly onward to success as the school logo promises! CONGRATULATION BOYS ON YOUR HARD WORK AND ONWARD TO SUCCESS! After a very long consideration and much study over a period of time, Mom decides to go for the third option offered by doctors for her breast cancer treatment. Western medicine offers a cut(surgery), burn(radiation) and poison(chemotherapy) approach which she has already opted for the first two on her first operation . After the second operation a month ago, she took the brave step to finish the course of what modern western medicine has to offer. After the second surgery on 14th October, Mom has been making follow-up visits to the hospital for doctor check-ups and for physiotherapy treatment. During this time of follow-up treatment, she was deeply considering the chemotherapy treatment. We appreciate the kind members of the Church who have been helping Mom to the hospital while Dad was away in KL. On one such visit to the hospital on Nov 16th, we got to meet an old friend of Dad's, Jim Lim and his wife Lailey, from Kuala Lumpur whose 12th year old daughter had just completed major surgery on her backbone. The operation was just the day before and on she was still recovering in the Intensive Care Unit (ICU) at that time. On 26th Nov, Mom met with Dr Khoo Wen Hsien, the head oncologist for chemotherapy, a friend of Dad's old classmate Dr Lam who used to work at the hospital in Singapore. Mom is well read and they talked using medical terminology familiar by both! She is finally firmed on going ahead with Chemo. He found a time slot for her to start her first dose. She chose the mild dose of Chemotherapy that will be administered to her starting on the same day at 4pm, repeated for another 3 times after every 3 weeks. She specifically planned the timing such that on the Christmas week of our family reunion, it will be a week after her second dose on Dec 17 so that the side effect will be lesser when all the family members gather. After spending the morning meeting with the doctor and after the necessary blood tests were done to determine the suitability of her condition, the chemotherapy treatment began at 4pm. It would take only about 30 mins or more to administer the drug through the vein of her left leg as she laid in bed. Prior to that about 30 mins was taken up by answering a detailed questionaire filled in by the medical person seen on the far right of the pic above. At about 5pm she was ready to walk back to the car for home, backed up by several medication she would take for the next three days to help her through the side effects of the chemotherapy drug such as nausea, vomitting and gastric effects. .... with some mild traffic jam on Orchard Road! CONGRATULATIONS MOM ON YOUR BRAVERY AND ONWARD TO RECOVERY! To follow her journey of treatments in the hospital, it is best to click here. What the boys do in Malaysia when they leave Singapore for holidays? Wow, looks like son number 2 has a following of girls as well!! And here you see his anxious look to open the door of his friend's home, a church member friend, ready with the pistols for a shoot-out! Besides IQ and EQ, their naturalist intelligence also gets a booster with an increase understanding of aspects of the natural world as they met their old doggie friends! Rex the German Shepherd, sheperding the boys in Kuantan to keep them in line by the roadside! With Tiger, the 'punched up face' dog too at the Kuantan beach house! Of course, increasing your Multiple Intelligence also requires eating well and they didn't miss out on this! ..... but got to eat lots of it too and I'm not talking crabs to you ok? Oh well! You can't avoid them coz they're everywhere right? Hey isn't that Simba junior you're playing with?? Something crawling in the jungle path? Swallows in the air that build bird's nest is what the neighboring estate owner is attracting but their uncle is just growing Dragon fruit on his land! Even the fish in the indoor pond gets their attention on their stomachs!